In 1652 the church put a door through the wall of Da Vinci’s Last Supper, directly underneath Jesus. I believe the reason for this was simply to reinforce the perception that the painting centers on Jesus. 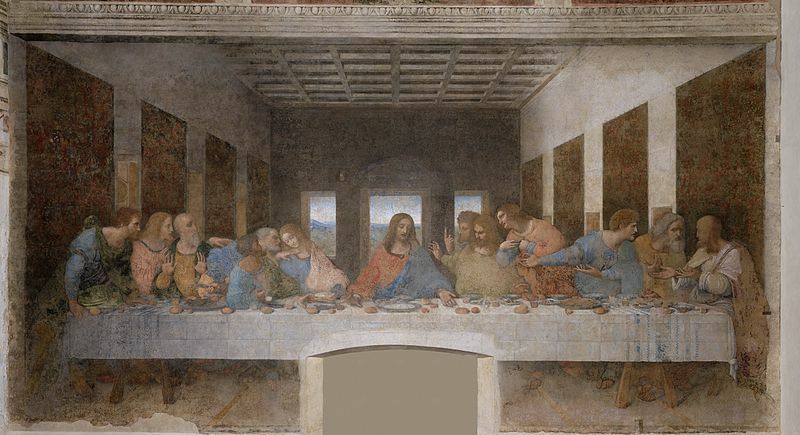 The center of the painting can be questionable, as DaVinci plays with perspective: Though the body of Jesus forms a big A at the center of the table… the Central Pillar, that penetrates the Female Chevron between Jesus and John, draws the eye powerfully to perceive the center between them. The door, cut into the wall below him, may have been an attempt to draw attention back to Jesus, as the center of the work. Da Vinci clearly satisfies the church’s focus on Jesus. Yet, when you stand back from the painting you can see that the walls on either side become the light and dark pillars of the Tree of Life. The Central Pillar does not have to be centered to be central. This pillar terminates exactly between the couple, joined in the place of Beauty, at the center of the Tree. The sixth Tarot key is The Lovers Key. If you view the center as solely a physical location on the painting, then Jesus rules alone. If you view the center as symbolic of the Tree of Life, the work clearly centers on Beauty, as the center of the Tree of Life. Da Vinci gives the physical center to Jesus (highlighted by the window) to satisfy the Church. The spiritual center, however, he marked within the Tree of life. In most Last Supper paintings, where the Tree of Life appears, both John and Jesus occupy the sixth place from the ends of the table. 6 is Beauty’s number at the center of the Tree. 6 also represents The Lovers Key. This is the place on the Tree where the lovers join and unite with each other and with Life itself. In Da Vinci’s version, however, John (Beauty) occupies this 6th position alone. Jesus does not. He is in the seventh seat from the right. It seems that, for Da Vinci, Jesus took part in a power grab… reflected in a single grasping hand… that worked to cut Her from the story. Note the position and expression of his right hand… as he reaches for the bread at John’s plate.